RENO, Nev. - A Nevada rancher said Monday he's trying to determine if federal agents damaged his cattle when the animals were rounded up then released in a showdown with angry protesters over a decades-long dispute about rangeland rights. U.S. Bureau of Land Management Director Neil Kornze said the agency backed off to avoid a potentially violent situation over the weekend. However, he vowed to go to court to collect more than $1 million in back grazing fees he says Cliven Bundy owes for trespassing on federal lands since the 1990s. Bundy, whose family has operated a ranch since the 1870s southwest of Mesquite a few miles from the Utah line, does not recognize federal authority on the land that he insists belongs to Nevada. On Saturday, the bureau released about 400 head of cattle it had seized from Bundy. The operation had been expected to take a month to collect as many as 900 cattle. The animals were freed after armed militia members joined hundreds of states' rights protesters at corrals outside Mesquite. Bundy said they were united in defense of their constitutional rights. The BLM's National Wild Horse and Burro Advisory Board was meeting in Sacramento on Monday on the broader issue fueling the conflict over how to divide the scarce forage on mostly dry lands across the West between livestock, wild horses and wildlife. Wild-horse protection advocates say the government is rounding up too many mustangs while allowing sheep and cattle to feed at taxpayer expense on the same rangeland scientists say is being overgrazed. Ranchers say the government refuses to gather enough horses in the herds that double in size every five years. Advocates on both sides accused the board of not addressing their concerns. "Americans want wild horses on our public lands," said wild horse advocate Bonnie Kohleriter. "You cattlemen and wildlife people are special interest groups. ... You need to stop attacking the wild horses, attempting to diminish their numbers, and make resources available to them." Debra Hawk, a biologist representing the Wildlife Society, said the BLM's failure to cut the number of wild horses is harming other species that rely on the land. She criticized the agency for indicating it may not continue the horse roundups, saying the BLM should "utilize all methods available" to cut the population. "Not conducting roundups will result in further degradation of native ranges, harming native wildlife and plants," and is better for the health of native horses, she said. Nevada Assemblywoman Michele Fiore said she spent much of the past week with the Bundy family and helped feed some of the calves that were returned over the weekend. "It's going to take a lot to revive the calves that were nearly dead when they were returned to the Bundy Ranch because they had been separated from their mothers during the roundup, and a few most likely won't make it," said Fiore, a Republican from Las Vegas. "It's time for Nevada to stand up to the federal government and demand the return of the BLM lands to the people of Nevada." Horse protection advocates and other critics of livestock grazing on federal land said the government's suspension of the roundup sends the wrong signal to law-abiding ranchers who secure the necessary grazing permits to use the land. The BLM "is allowing a freeloading rancher and armed thugs to seize hundreds of thousands of acres of the people's land as their own," said Rob Mrowka, a senior scientist for the Center for Biological Diversity. "It's backing down in the face of threats and posturing of armed sovereignists." BLM spokesman Craig Leff said the agency will work to resolve the matter "administratively and judicially" but planned no further public comment on Bundy's case. "The gather is over," he said in an email. 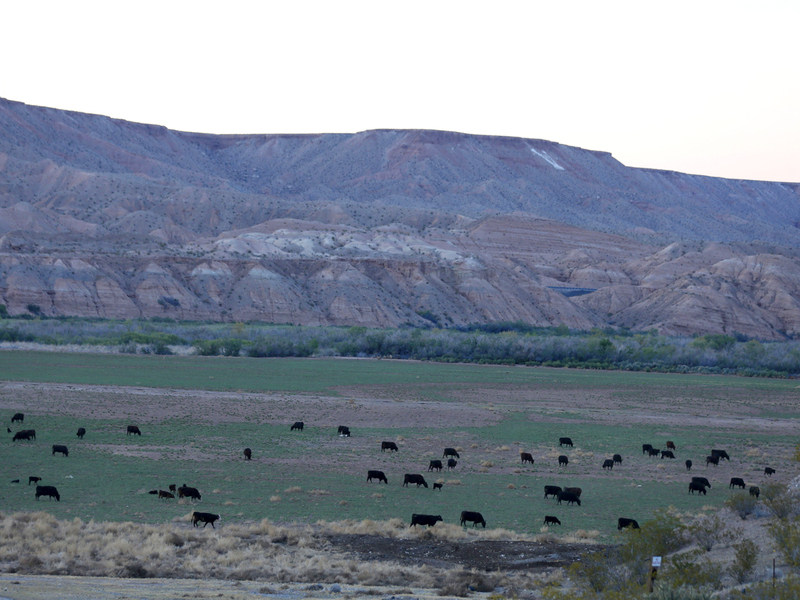 In 1998, BLM secured the first of a series of court orders that found Bundy's cattle in trespass, rejecting his argument the land in an area known as Gold Butte belonged to the state. BLM filed a new complaint in U.S. court in Las Vegas in May 2012 seeking an injunction to prevent what it called Bundy's continued trespassing, and Judge Lloyd George issued another order last July authorizing the agency to impound the cattle.